Travelling in Telengana,around Hyderabad always give touch to deccan history,every turn of the roads will tell you something or the other. Even outside of Hyderabad, there lays several historical place that will give you the essence of great deccan dynasty. This trip was arranged by Ujjal and Mangalika (our friend). Before heading towards this place, we (my wife and me) had no idea , where we were going.Every visit gave us new experiences,new learning and more joy. We did not bother much.We wanted a break. So thought to escape for a day to koilkonda to retreat ourselves. Just before going, we got to know the name of the place was Koilkonda. I googled it and found to be a fort. We started our journey at around 12 noon. We drove till TSPA via service road and met outer ring road.We took exit no 16 then towards Bangalore highway.we paid Rs 30 toll to the toll gate of ORR and collected two way toll ticket on the Bangalore highway.Cost-Rs 90. 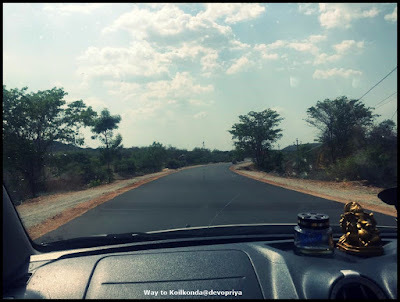 This was the first time , we were travelling towards Mehbubnagar.The Bangalore highway was awesome to drive with excellent four lanes.We took almost 1:30 hrs to reach Mehbubnagar. After Mehbubnagar we took right towords Koilkonda. The road was good. More we went towards the fort the scenic beauty becomes prominent even at the 43 degree in full summer on April 31st. Koilkonda fort situated on a hill top of Koilkonda hill. It was a tax collection outpost of great qutb shahi dynasty.Not too many people visit this place compared to other destinations of Telengana. Ujjal asked many people for the correct route. To my surprise , not many locals knew about this place.We had to follow google map and the guidance of very few locals. Finally we reached at the base of the fort.The tax collection point lost its glory and even locals began to forget it.One more experience, we had. That is locals don’t know much Hindi. I asked them where is the killa? They could not understand. But when asked where is the Koilkonda fort, they showed us the direction. Koilkonda was a very remote place of Mehbubnagar hence offered very basic things. There was nothing called a proper hotel or restaurant. Few tea stalls were available on the road. We did not opt for tea. People were mostly poor. They were conservative too.So unnecessary exposing or flashy cloths could draw attention of the locals. All of us were on normal and formals.There were no ATM facilities,even petrol bunks did not accept card!!. Medical shops were available near the koilkonda bus stop.I had noticed few doctor’s name in the dispensaries. Also small puncture shops were available but I did not notice any big garage.I did not notice any hotel or accommodation facilities.From the Koilkonda bustop we had to take left to reach Koilkonda fort. Once we took the final turn, we could see the glimpse of the fort. Till the base of the fort, it was motor able so we drove till last. The fort area was vacant.There was plenty of fort’s space available right in front of the base but no systematic parking was available. Just found two good places and parked our cars.No security guards were available. There were no entry fee. We were up for a guide,who could have explained us the history, eased the journey with some hidden path used by locals. But we found none!!!. At around 3:05PM we started climbing to the fort on our own.We heard that there were seven gates till we reach to the top.Mangalika and Ujjal had some information about this fort so they started guiding us.There was a clear way leading to the fort. We followed that.At the beginning and till the mosque (situated on the hill), the path was beautiful then the actual adventure started. Near the Mosque there were two roads. One went left and one straight. We took the straight one. We left the other road for future trip. The steps became slippery and path become narrow. One misstep may cause serious injury.A good trekking shoe was necessary but since me and my wife underestimated the hill thinking Koilkonda would be same as Golkonda, we trekked with a badminton shoe and a chappal. In some places the path became even narrow. We decided that if we were not able to climb,we would sit down and climb. The journey to the hill top was not as easy as we expected. On top of this, scorching sun made us dry. To hydrate and to pump oxygen we took three breaks in total.The breaks were not so comfortable. Sun god was testing our patience and determination. It was like on top 43degree sun and down the rocks were so hot to sit.Since, we were not regular climber , we took little more breaks. Finally with lot of determination ,we reached to the top. As I said earlier, this place was vacant too. No food facilities were available like Golkonda. There were no toilet facilities. We carried our own snacks and water bottle.on the top of the koilkonda we utilised them. In the whole journey,we did not come across any people. There was pin drop silence in the hilltop. Btw, there were two reservoirs, we saw during our journey to the top.From the top the city looked great. The Koil Sagar view was breath taking.The hill had plenty to offer. The medical garden, holy water,observing the life down from such a high altitude, grand hill top made our day.If you are in a group and have sleeping bag, I would suggest to stay here for a night. Crazy idea but worth exploring.Far far away from hustle bustle life,close to mother nature!! A request to all my visitor-it is our duty to save mother nature.So just because they do not have any security or cleaner, please don’t throw away plastic bottles, snack packets or other edibles. Previous articleHow to Setup Cucumber and More Details On Cucumber?